Anaerobic Digestion holds great potential in Northern Ireland. Until recently, low uptake of anaerobic digestion in Northern Ireland, was leaving a large untapped biomass resource in the province. Recently, this has been seeing a correction with a number new AD plants built to use the plentiful biomass resource. If you have just arrived and need to bring yourself up-to-speed on this subject, we will explain that AD is the natural process that recycles organic materials including food waste, sewage sludge, agricultural waste, and if necessary, purpose-grown energy crops. It produces renewable heat and power, clean transport fuel, and organic biofertiliser, helping to reduce greenhouse gas (GHG) emissions. According to ADBA, the last 10 years has seen a rush to install Anaerobic Digesters in Northern Ireland. There are now 34 operational plants in Northern Ireland, ranging from 180kW to 3,000kW, and 30 of these are classed as “farm-fed”. A remarkable fact is that Northern Ireland, now has more anaerobic digesters per capita, than England, Wales or Scotland. The Northern Irish AD market has grown by over 2,000% in recent years. 24 new plants have been commissioned since 2015, and the industry is now bringing in £28.5m in revenue and producing 22.8 MWe of electricity each year. But, this is still only scratching the surface of the potential which exists for anaerobic digestion in Northern Ireland. According to Queen’s University Belfast, AD has the potential to reduce Northern Ireland’s emissions by 2.4 million tonnes of CO2e annually, a reduction of 12%. The province badly needs these emissions reductions, because its performance in carbon reduction is trailing behind. Northern Ireland reduced its greenhouse gas emissions by just 18% between 1990 and 2015, compared to 38% for the UK as a whole. Source: Publically available articles on the Anaerobic Digestion & Bioresources Association (ADBA) blog. ADBA is the UK’s trade association for AD. 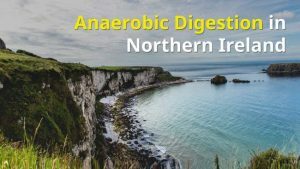 Anaerobic Digestion is a perfect renewable energy for Northern Ireland where the main industry is agriculture, the waste generated in this industry is the input for the AD plants! In volume terms, on-farm anaerobic digestion (AD) in Northern Ireland has the greatest potential for cattle and pig farms. Northern Ireland’s Anaerobic Digestion (AD) sector is set to rocket within the next half decade. A government official who deals with the processing of applications revealed there are currently 103 AD sites either in construction or already approved in the region. Once completed, these will be capable of processing around 1.4 million tonnes of feedstocks a year. 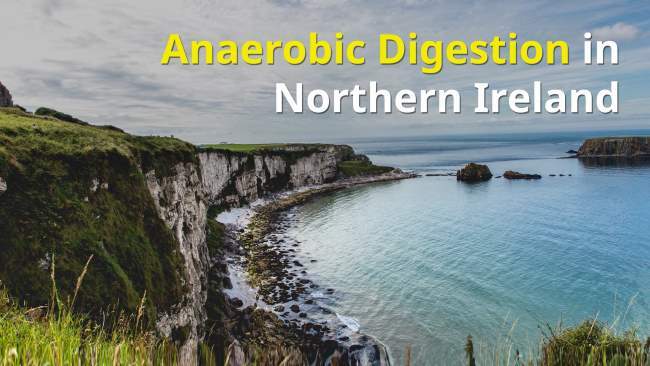 The figure is more than double the total currently used for anaerobic digestion in Northern Ireland, Keith Finegan from Northern Ireland Environment Agency’s Natural Environment Division explained at an AD conference in Belfast. It could make finding conacre and silage harder for farmers, but researchers say there are also environmental concerns – digestate from the plants contains high levels of nitrogen in the form of ammonia. Anaerobic digestion has become a popular diversification for farmers as the extra income often subsidises other parts of the enterprise. 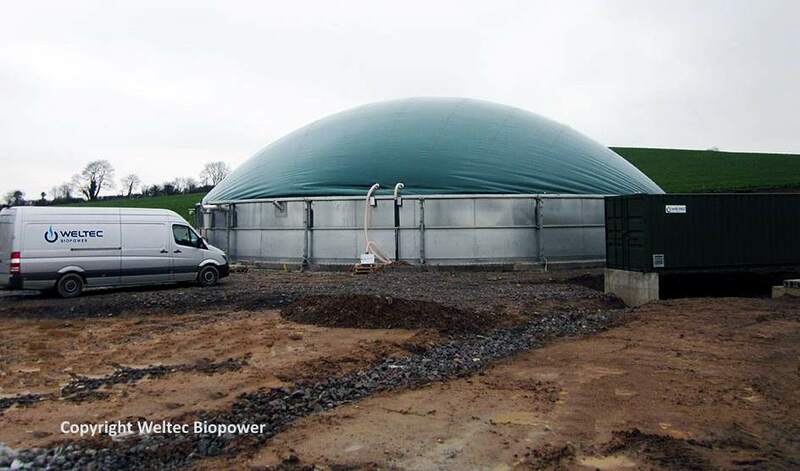 German biogas specialist WELTEC BIOPOWER is currently building three anaerobic digestion plants in Northern Ireland. All three 500-kW plants will shortly be completed and will go live in summer 2018. Two of them are being set up in County Antrim in north-east Northern Ireland. Another plant is being built in Benburb in County Tyrone. Thus, WELTEC will soon account for nine of a total of about 40 biogas plants in Northern Ireland. In recognition of this strong overseas commitment, WELTEC BIOPOWER recently qualified for the second place in the ranking of the German Foreign Trade Award. At first glance, the three new 500-kW anaerobic digestion plants in Northern Ireland look similar. Henceforth, all biogas plants will largely be charged with slurry and pig, cattle and poultry manure as well as a small amount of renewable raw materials. Nevertheless, the WELTEC engineers have developed an individual concept for each plant, as the substrate composition and retention times vary. For example, the plant in County Antrim will only have one 2,625-m3 stainless-steel digester. The second advance anaerobic digestion in Northern Ireland, is a new AD Plant which is located nearby. It provides for two digesters with a capacity of 2,625 m3 each. The plant in Benburb will use a slightly larger stainless-steel digester in order to extract as much energy as possible from the substrates. says Kevin Monson, Sales Manager UK, commenting on the reasons for WELTEC’s success. It is no surprise, then, that WELTEC BIOPOWER qualified for the second place in the ranking of the German Foreign Trade Award in the small and medium-sized segment. On 19 April 2018, the award was conferred for the 10th time. The ceremony was conducted at the end of the German Foreign Trade Day by Dr. Carsten Sieling, Mayor of Bremen, and Harald Emigholz, Chairman of the Bremen Chamber of Commerce. Specifying the reasons for the bestowal of the award, the jury pointed out that WELTEC BIOPOWER started engaging in foreign trade as early as a year after its foundation in 2001. Today, more than 300 WELTEC plants exist in 25 countries on five continents. At present, addition to its activities to raise the capacity for Anaerobic Digestion in Northern Ireland, WELTEC energy plants are being built in Uruguay, France, Croatia and Greece. Many people who visit this page are also interested in the Cost of Anaerobic Digestion Plant.